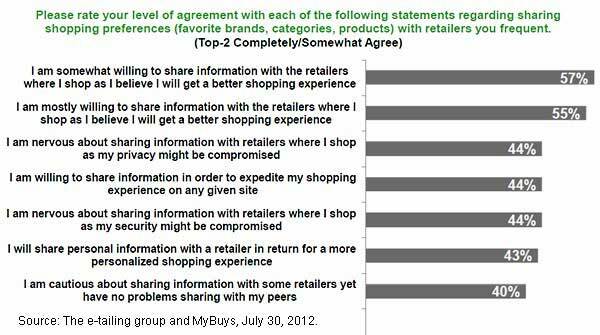 Despite privacy concerns, consumers are more comfortable sharing their personal information with retailers than they are with social networks, particularly if sharing such data enhances the shopping experience, according to a survey from MyBuys and the e-tailing Group. Some 55% of surveyed consumers say they are "mostly willing" to share information with retailers in order to get a better shopping experience, and 57% say they are "somewhat willing" to do so. More than two in five consumers say they are willing to share information in order to expedite their shopping experience (44%), or have a more personalized shopping experience (43%).